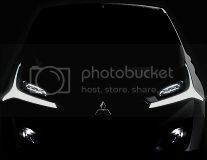 A few weeks ago you saw here two teasers of two cars Mitsubishi was going to reveal at the Geneva Motor Show, but today, like most cars that are going to be revealed in Geneva, we get the first view of the cars, and they look good. It's always nice to see something different from a brand that has been making a few "ugly" cars. Mitsubishi still believes electric cars are the future, even if nobody buys them, and must be the reason they will introduce two new concepts at the Geneva Motor Show, the GR-HEV, The Sport Utility Hybrid Truck, and the CA-MiEV, The Suburban EV.